Electrical Earthing should be done to prevent humans and other appliances from fault current and also to prevent the damage caused by Fault current. If you didn’t have an electrical earthing in your house, do it immediately as damage can occur at any time. Let us see how to do a perfect earthing system for a house. Grounding Rod or Earthing Rod. The Earthing Rod should possess the following specifications. The diameter of an Earthing Rod should be 20mm. The Length of an Earthing Rod should be 1500mm. One end of the Rod should be conical structure. The top of an Earthing Rod should have an adjustable clamp. The Earth Wire should be made of copper or Galvanised Iron. A tool is needed for adjusting the clamp. Example: The Spanner and the Cutting Pliers. To check the continuity, A continuity tester can be used. To make a pit, Shovel or Land Drilling Machine can be used. The earthing pit should be in the dimension of 150cm x 15o cm x 300 cm. Both of them are good conductors of an electricity, in order to enhance the conductivity salt and charcoal should be added. The first step involved in installing the Electrical Earthing in a house is to excavate a pit for burying an Earthing rod or Earthing Electrode. The pit should be excavated near the house and the precautions should be made in this. Before excavating, check whether any pipes are already placed underground. The Pit should be 3 meters deep. The shovel can be used on soft places and on rocky places, a land driller can be used but avoid using rocky places, if there are no other ways means use rocky places. Put a layer of Salt, Sand, and Charcoal and then place an Earthing Electrode vertically inside the pit. Cover the remaining Portions of the pit with a Salt, Sand and Charcoal combination. If you are going to use construct a border using cement then don’t do that task now. 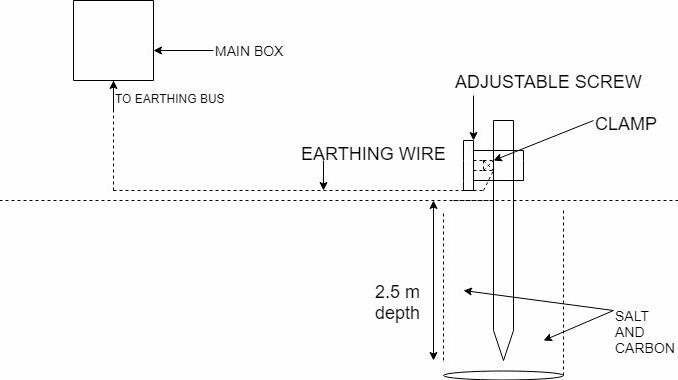 Now, Connect the Earthing bus and an Earthing Rod with the help of Earth Wire. Earthing tools can be used for Adjusting the clamp. Once done, use the Continuity tester and check the continuity. Now it’s time for you to Construct a Concrete or cement border around the Pit. While opening the main box be careful, as it deals with electricity. Follow the electrical Safety Rules without fail. If you are unfamiliar with technical terms, better contact a technician to do this task.